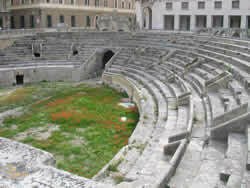 Lecce, chief town of province, is located between the Adriatic Sea and the Ionic Sea. Lecce, refined and aristocratic city, spiritual and intellectual rather than economical and commercial, has its class that comes from centuries of civil life. 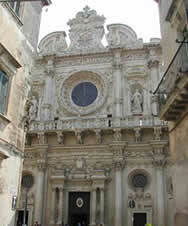 For the beauty and richness of its monuments and for faith to its traditions, Lecce was said “Athens of the Puglie”. Thanks to its baroque style it has deserved the appellative of “Firenze of the South”. In fact, in the local seventeen century style, it is possible to appreciate the very rich sculptural motives done with the tender stone from Lecce. The old town enclosed by what is left of the ancient walls, bears the impression of that exuberant period. In Lecce, the presence of several religious orders, gave rise to a procession of churches of which the faAades are magnificent like open air altars, real windows of the society of that period. The secret of the baroque style is in the stone from Lecce: a marble limestone with a compact and homogeneous grain, but so tender that it is possible to work on it with a chisel and a hatchet. It was used to make twisted columns, sumptuous frames, pierced balusters, frontons, flower and fruit vases, fluttering ribbons, putti and big masques. The monument that better explain the baroque is Santa Croce basilica. It dates back to 1549 and was finished in 1689.Its restoration brought back the monument in all its extraordinary splendour. In Lecce there is also the Dome that was built in 1144 and in 1230. It is shaped as a Latin cross and has three isles divided by pillars and semicolumns. It is enriched by 12 altars, the bell-tower of about 68 meters and the adjoining Seminario Palace of 1694-1709. Other monuments of the baroque period are: the roman amphitheatre that has a remarkable size, S. Oronzo Square with the saint statue, the Sedile or Palazzo del Seggio that was built in 1592, the Government Palace that was once the Celestini convent and several churches. Among the most important churches there are: Santa Chiara with a rich doorway on an elegant faAade, the church of the Saints NiccolA? and Cataldo that was built by the Normans but finished with a baroque faAade and the Teatini church. Crossed the enclosure walls that holds the historical centre one has to raise ones eyes to admire Porta (Door) Rudiae that was so called because from it started the road for the town of Rudiae; Porta Napoli, also known as the Arch of Triumph, is in the square bearing the same name or Obelisco Square; Porta San Biagio that dates back to 1700. Lecce is also known for its papiermachA handicraft. With juniper networks, we have the performance and availability we need https://writemyessay4me.org/ to do that.